“Nature is the channel through which my life flows,” says Sandi Pillsbury Gredzens. A practicing artist for more than 40 years and an art educator for more than 30 years, she is committed to capturing the world around her and sharing it with others. She specializes in realistic impressionism paintings, and feels that her art gives viewers a sense of peace and serenity. Her preferred mediums are oil, acrylic, alkyd, and sometimes watercolor. Her paintings feature subjects like Lake Superior landscapes, flowers on Minnesota’s north shore, rocks underwater, waterfalls, night scenes, California, and Christmas. Ms. Pillsbury first became interested in art as a child, when her parents gifted her a paint set; her first ever. Pursuing her newfound passion, she earned an Associate of Arts from Stephens College in Columbia, Missouri, in 1971 and obtained her first hands-on position as a layout artist for Monterey Peninsula Herald in 1973. 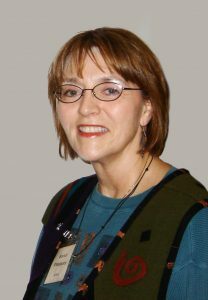 Later in her career, Ms. Pillsbury returned to school to further her knowledge and received a Bachelor of Fine Arts from the University of California-Santa Cruz in 1980 and a Master of Education from Hamline University in St. Paul, Minnesota, in 1995. She is a certified elementary and secondary school teacher. Over the years, Ms. Pillsbury has held a number of teaching positions. She loved being able to educate the younger generations and inspire them to be excited about art. Ms. Pillsbury’s first foray into the public school system came in 1978, when she became a special education teacher’s aide and substitute teacher for the Pacific Grove Unified School District. Since then, she has been an art educator for Shattuck-St. Mary’s School, an elementary school teacher for Woods Academy, and an elementary art teacher and consultant for Anoka-Hennepin Independent School District. Her most recent title was art teacher and community educator for the Lake Superior School District, which lasted from 1997 until 2008. Although Ms. Pillsbury may have retired from academia, she is still very active in the art community. She runs her own studio, North Shore Serenity, and takes part in Grand Marais Plein Air, an outdoor painting competition in which artists have seven days to capture the 3,340 square miles of Cook County. Blank canvases turn into fresh works of art depicting this scenic landscape. Further, Ms. Pillsbury has been a guest artist at the Lake Superior Circle Tour, which takes place every September around the lake, for the past six years. She has exhibited her paintings at venues like the Grand Marais Art Colony, the Itasca Art Association, the Sally Brown Collaborative Art Exhibition, the Union Street Gallery in Chicago, the Duluth Art Institute, the Lake County Court House Atrium, the Johnson Heritage Post, and the Schroeder Heritage Center. As an active arts advocate, Ms. Pillsbury is involved with several art boards throughout the Arrowhead region in Minnesota. She is currently the secretary of the local Two Harbors Art Club, Voyageur Artists, serves on the Northern Lake County Arts Board, and is a member of both the National Arts Educators of America and the Art Educators of Minnesota. Additionally, Ms. Pillsbury has been a returning artist-in-residence in Silver Bay for the past several years, is on the artists’ roster with the Minnesota State Arts Board for artist-in-residency programs, and continues to volunteer her time in a third-grade classroom with the Masterpiece Art Program. In the past, she has taught community education art classes and classes at the Grand Marais Art Colony and has served as the chairman of the Grand Marais Art Colony Board. In recognition of her work, Ms. Pillsbury has been listed in Who’s Who in America, Who’s Who in the World, and Who’s Who of American Women. Other than painting, Ms. Pillsbury’s special interests include hiking, photography, and gardening.